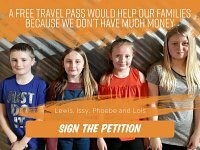 Young carers in Sheffield have set up a petition calling for free bus passes for young carers so they can undertake their caring responsibilities more easily, carry on with their education, training or employment, and have the chance to have a social life.The petition will be presented to the full council meeting on Wednesday February 6th. 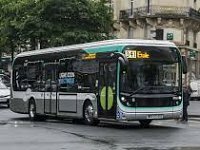 A bus driver in Paris who ordered his passengers off to let a wheelchair user on his vehicle has been praised by disability groups. Francois Le Berre, who has multiple sclerosis, was in danger of being left stranded at his stop when the other passengers refused to move to enable him to take up one of the bus’s two wheelchair-accessible spots, until the driver intervened…..
Disabled Supertram users are being asked to contribute to a consultation on the future of the transport system in Sheffield. The consultation will help them to recommend an option for funding from the Department for Transport. The Local Government and Social Care Ombudsman issues a warning to local authorities, following an investigation into Lewisham council’s failure to provide transport for a young disabled adult attending college. 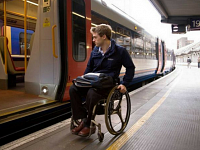 In a letter released under Freedom of Information to the Association of British Commuters the Chair , it’s been revealed that the government’s own Disabled Persons Transport Advisory Committee issued a clear warning to the Department for Transport on this issue. For people with sight loss listening is vital when crossing roads – but the quietness of new electric and hybrid cars could prove to be a problem. 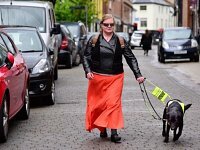 The national charity Guide Dogs are calling for action to benefit all pedestrians. 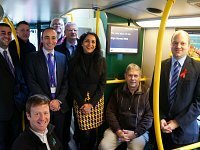 What do you think of the new 'talking buses' in Sheffield? 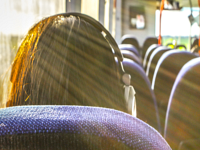 Five months on from the launch, South Yorkshire Passenger Transport Executive would like your feedback on the new audio-visual displays on the 120 route buses in Sheffield.